The simple white frosted finish can read like the surface of coral in the sea or bones in the desert, blending into the surroundings or standing out dramatically according to the lighting. Note also the subtle play of shadows under the piece. I am fascinated by the play between geometric precision and random organic variation that we see in Nature so much of the time. We can see some kind of immutable logic in patterns of growth, but our rational mind is confounded by the odd twists those patterns take in response to forces seen and unseen. This composition is an exploration of such patterns in a form both implies and denies functionality. The frosted finish fades in and out, contributing to a subtle or ghostly presence in this piece. The form more nearly approaches a complete sphere than in some of the other baskets. This accentuates a different kind of visual tension between completion and openness in the form. I started making spherical forms with organic, web-like patterns back in the 1980s, and have periodically revisited this theme over the years. I suppose that these were first inspired in me when, as a young child, I saw the models of magnified microorganisms at the Museum of Natural History in New York. Those models were made by Herman O. Mueller in the 1920s, and included individual plankton and rotifers as well as a large diorama representing a cubic inch of pond water magnified dozens of times. I was captivated by the idea that these beautiful translucent forms thrived even in the small Connecticut pond on my parents’ property. The aesthetic union of organic and geometric forms in glass was fascinating to me long before I realized I could melt glass myself. Later, when I first saw the Blaschka glass flower models at Harvard University this fascination deepened. 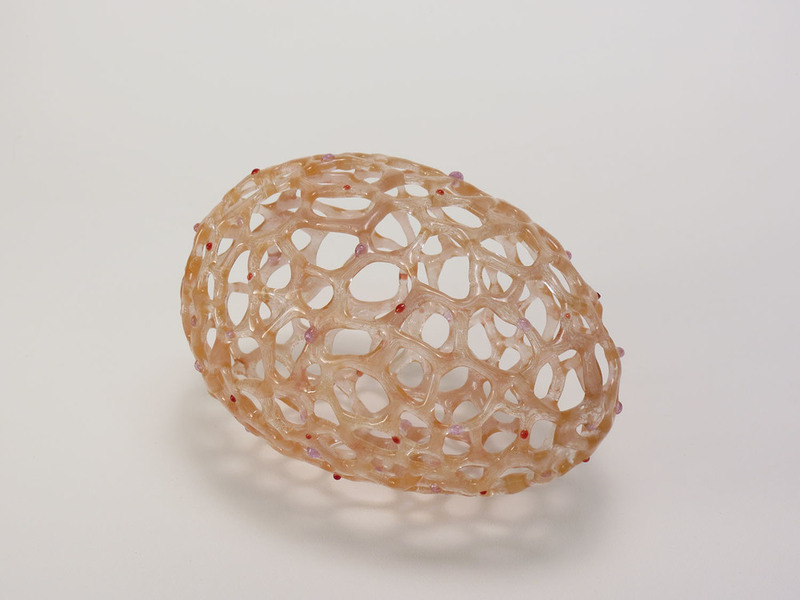 The Blaschka models also included microscopic structures blown up to a perceivable size, and again the intersection of the organic and the geometric struck me as a fertile field for exploration. 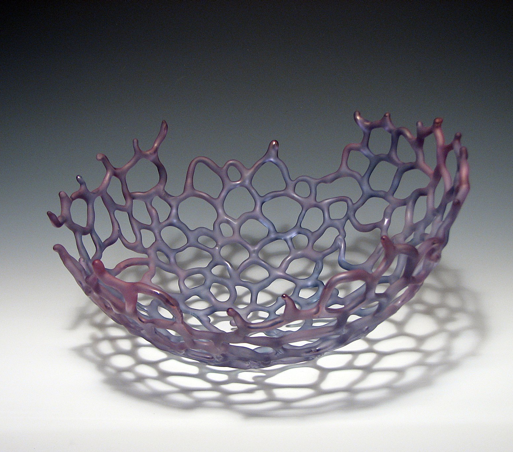 By that time I was in high school and learning to blow glass myself, and while it would be a few more years before the spheres and baskets came into being, their aesthetic foundation was already formed. To me, the Spheres are not biological models, however. I regard them as a kind of vessel, in which the tensions between organic and geometric, inside and outside, negative and positive space, growth and decay all play out across a translucent surface. The primal, perfect form of the sphere is counterpoised with the idiosyncratic, irregular pattern of glass rods that define its shape. Light and dark are also involved in this play of opposites, because the shadows cast by these forms are, to me, and important element of these works. Examples from this series are in the permanent collections of several museums, including the Corning Museum of Glass, the Sphere Museum of Tokyo, The Niijima Glass Art Center (Japan) and the Museum für Glaskünst Lauscha (Germany). Each of these unique works is a vehicle through which I explore the notion of the vessel and elemental form, as well as personal expressions of color, surface texture and especially the play of light and shadow. Baskets represent a variation on the themes of the Spheres, in a more open form that invites engagement of the interior surface. Here the concept of the object as vessel is more obviously stated, while still visually tenuous. As in the Spheres, there is an ongoing dance between geometric and biomorphic, growth and decay, negative and positive space. I sometimes think of sea anemones as I make the Baskets, with the irregular strands of glass along the rim standing in for the undulating tentacles of those translucent sea dwelling creatures. At the same time, especially when the surface is frosted (sandblasted) I think of desert detritus, like the abandoned fibrous skeletons of the cholla cactus or sunbleached bones etched by the elements. I enjoy the paradox of forms that seem equally reminiscent of the ocean or the desert southwest. The cinematic effects of light and shadow are an especially important element of these compositions, which have been exhibited around the US and internationally, including at the Venice Biennale. The series of platters I made between 1999 and 2002 take the baskets one step further. The form is even more open, and when mounted vertically on a wall, their patterns of light and shadow have a different type of drama. They are three-dimensional, yet can blend into the flat wall behind them as lighting conditions change. In the case of shiny surfaces, the curvature of the platter surface creates a dynamic play of highlights as the viewer moves around the piece or as the sun moves across the sky. A section of the web pattern formed from glass rods. The section with curvature established. How are the Spheres Made? 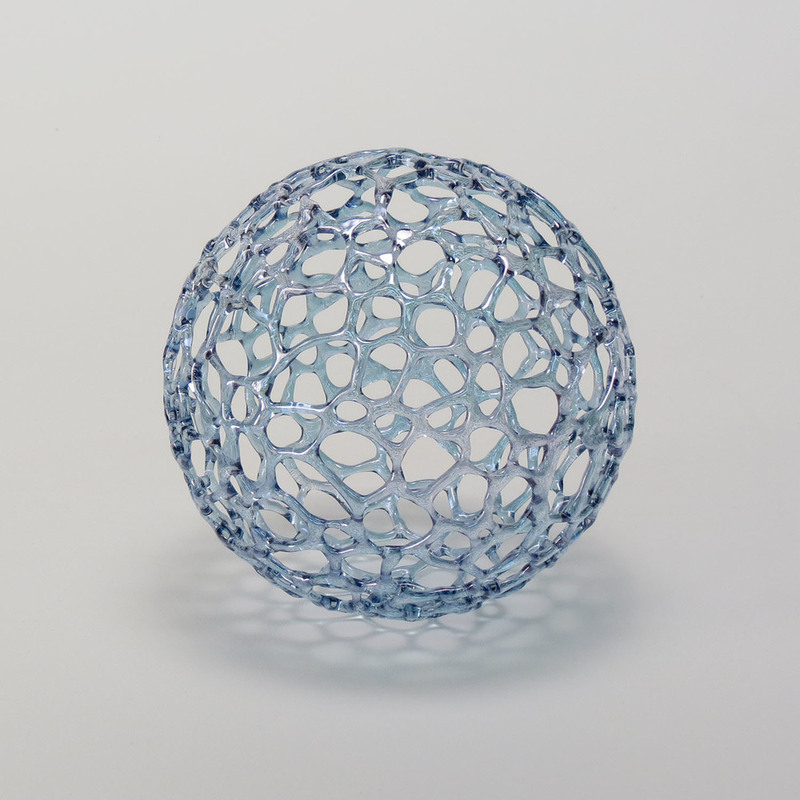 The Spheres all start as borosilicate glass rods which are bent and fused together in a gas-oxygen torch flame. I begin by making roughly hexagonal sections of the desired web pattern. These sections are then slumped into a stainless steel form in a kiln at about 1575° F. This gives the sections their curvature. It takes six to eight of these sections to make a complete sphere; they are pieced together in a painstaking and time-consuming process which involves a lot of trimming and filling in gaps in the pattern. 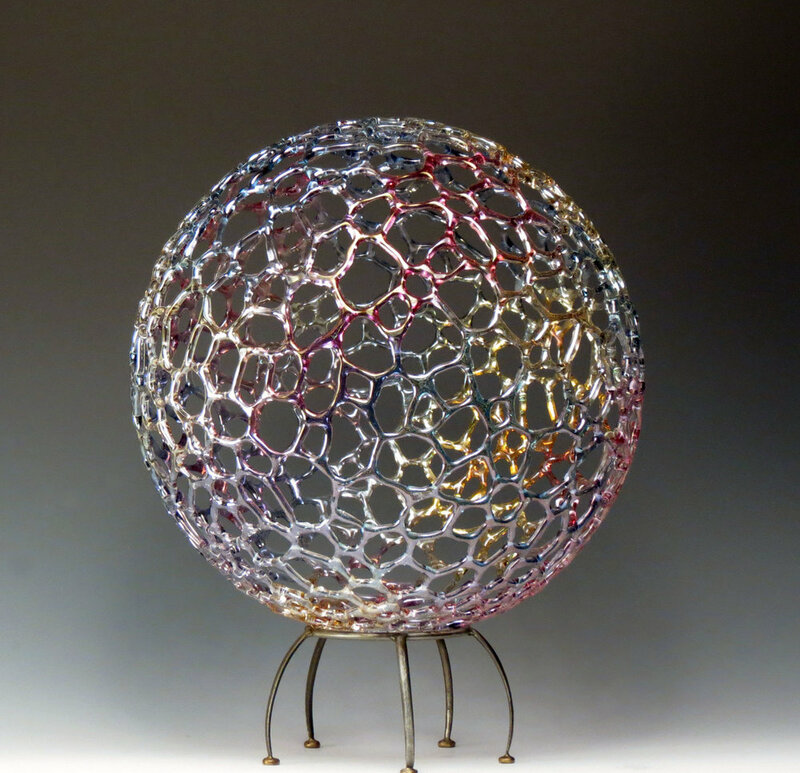 Sometimes the color in these pieces is intrinsic to the glass, a result of metallic oxides in the glass formula. At other times, I will apply lusters, which are fired onto the surface of the glass to give iridescent colors. Sandblasting gives the surface a frosted finish. Different combinations of these techniques are used to give the effects I desire. A similar technique is employed to make my baskets and platters.